ITALY needs a competitor to Juventus. It has been five long years of Turin dominance and Italy’s other football power base, Milan, has slowly sunk into mediocrity. Italy and UEFA needs clubs like AC Milan and Inter to regain their strength. In the black and blue side of Milan, it may be about to happen. In the era of super clubs, Inter have fallen away from the pinnacle of European football. It was as recently as 2010 that Jose Mourinho led them to the UEFA Champions League, but since then, the drop in status has been depressing for the Milanese. But despite the lack lustre on-pitch performance, Inter is still a powerful brand. The club has a huge fan base globally and according to Forbes, enjoys a top 20 place among football brands. Little wonder that the credibility-hungry Chinese eyed Inter as prime real estate. 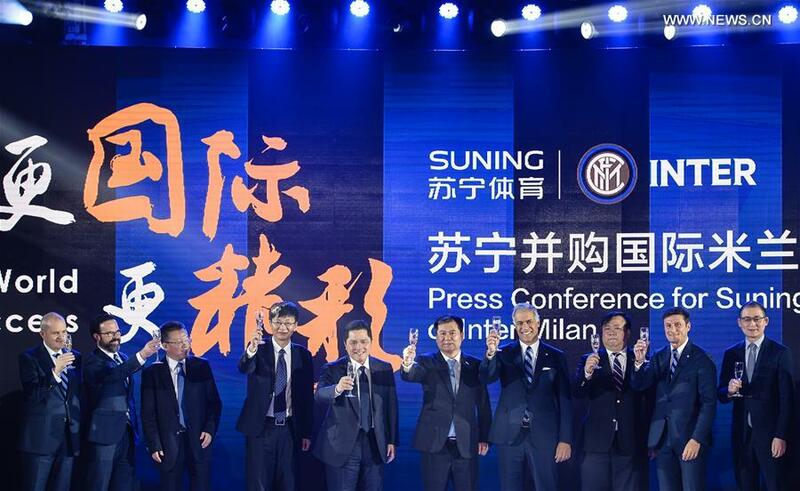 In early June, China’s Suning Commerce Group acquired a 70% stake in Inter, paying more than USD 300m. Inter represents the highest profile acquisition in European football by Chinese investors to date. Suning is building a football empire, make no mistake. The company owns Jiangsu Suning, formerly known as Nanjing, the club that recently paid £25m for Chelsea’s Ramires and £50m for Alex Teixeira of Shakhtar Donetsk. Suning’s interest in the game also extends to buying TV companies that live stream football, including Spain’s La Liga. “Acquiring Inter Milan is a major part of our international development and the first step to move into South East Asia and European markets,” said Suning. Suning is owned by Chinese billionaire Jindong Zhang, who is said to be worth USD 12.7bn, making him one of the richest individuals in the world. “We are going to make Inter more stronger and more splendid,” he said at the showbiz-style press conference that announced the transaction. Zhang also promised that Inter would benefit from “Chinese elements”, whatever that might mean. There’s great expectation that, roughly translated, this will mean cash for investment in players. This may come as some relief to the club’s previous owner, Erik Thohir, who commented that, “I can’t deny I need help. It’s important for Inter to grow and to be sustainable.” Thohir will stay on and has said he has no intention of selling his remaining 30% stake in the club. Zhang bought 40% from Thohir and 30% from Massimo Moratti. Thohir, who took the club over in November 2013, had a five year plan, of which 2016 is year two. For 2016-17, the club is already targeting Champions League qualification for the first time since 2012 and a real stab at winning the Europa League. The club’s value has increased over the past year, but it is still way behind the leading European names. The big clubs generate revenues of more than EUR 300m – Inter were at EUR 165m in 2015. Encouragingly, Inter’s attendances in Serie A in 2015-16 went up by 22%, making them the best supported club in Italy. After finishing fourth in the league in 2015-16, Inter’s Chinese owners are starting from a relatively strong base. The club also has good links with Asia and was the first Italian club to visit China in 1978. Apparently, Inter has 135 million fans in China and 190 million in the Asia Pacific region. That’s a huge audience to leverage off. The purchase of such a significant stake in a prestige name like Inter does suggest that there might be similar grand statements coming from China in European football. Certainly the country’s campaign to become a force is gathering momentum – Dalian Wanda Group has just agreed to sponsor the next four World Cups and the company has just purchased a 20% stake in Atletico Madrid. Chinese investors have also been looking at Inter’s stable-mates, AC Milan. That Italy should be now firmly on China’s radar screen is no surprise. The country has been crying-out for more diverse investment in its football and with China keen to attain greater credibility and impetus, one of Europe’s traditional strongholds represents a prime opportunity. Furthermore, companies like Alibaba, Dalian Wanda and Suning are all anticipating global expansion. While some will see Suning’s owner, Zhang, as something of a Chinese “oligarch” doing his duty in response to government pressure to invest in China’s football dream, Inter’s fans will be expecting great things. Already there is talk of big name players arriving at the San Siro to play for the Nerazzuri. Yaya Toure of Manchester City is one of them. Next Entry Now Higuain is going nowhere, who are the hottest targets?